Welcome to the PCYC “Round Grenada Regatta” 2016! Results of the 2016 Round Grenada Regatta are online! Click to download the NOR as a PDF. Click to download the charts a PDF. Click here to find out what is happening in Carriacou! Click here to find out what is happening at the Final Prize Giving! Download the Schedule of Events 2016 as a PDF. In 2015, Petite Calivigny Yacht Club in Grenada revived a long tradition of round the island racing and put on a very successful event that drew 9 monohulls and 3 catamarans. Starting and finishing at Le Phare Bleu on the south coast of Grenada, which has been home base for the PCYC since it was initiated in 2010, this regatta includes an overnight layover in Tyrell Bay, Carriacou, for crews to enjoy a good party and get some shut eye before heading back down to Grenada. For those who enjoy a longer course with a more relaxed style of racing, this is the ideal off season event and everyone is welcome. With time to appreciate the natural beauty of the Grenada and Carriacou coastline and the surrounding small islands, you will still find it challenging in terms of navigation, strategy and crew determination. The overnight stop means that single handers and “live aboards” can join the more dedicated racers, brush up their sailing skills (perhaps even dig a spinnaker out of the locker) and show what they are made of too. The format will be similar to last year, but instead of being able to choose to go clockwise or anti-clockwise, this year all the boats will be going up and down the same way. 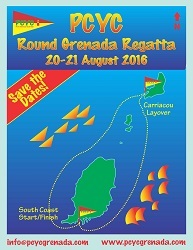 You can register online at http://pcycgrenada.com/round-grenada-regatta (fee EC$100 to be paid at registration). 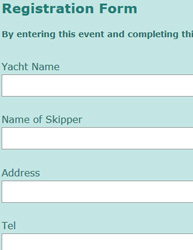 Registration on Friday 19 August, 1400-1700 h, will be followed by the Skippers Briefing at 1800 h, both at Le Phare Bleu. The Start on Saturday 20 August will be at 0630 h, at Le Phare Bleu and there will be a party and food in Carriacou that evening. The Start on Sunday 21 August will be at 1000 h, in Carriacou and the Final Prize giving will be in Le Phare Bleu, as soon as last boat is in. Dockage at Le Phare Bleu is “2 nights for 1” on Friday and Sunday; regular rates apply for additional nights. Dockage/mooring at Carriacou Marine is limited.